News reporter…that was me. I had a gift to write since I was five years old. I enjoyed an incredible and wonderful career as a news reporter. I went to college on a partial scholarship for Journalism and graduated with a double major, (Broadcast and News Journalism), obtaining a B.S. degree. I was a news reporter, and that was all I could see myself doing. Upon graduating I landed my first job as a reporter for a Publishing Company, which owns 13 newspapers today. I covered everyday beats…local township and planning board meetings, local events, wrote obituaries, biographies, news stories and the like. Ultimately, I was given a story that came across my news desk on a paper napkin: something about aircraft noise? Little did I know that note would become my beat for the next three years, and would ultimately land on the cover of the NY Times garnering multiple accolades and awards. I worked with Phil Lempert at the Lempert Company, Phil Donahue, Joan Lunden, met Dan Rather, George Bush Sr., and so many famous musicians, working as a reporter. But then, my passions changed. No explanation other than to say I was led by my other passion: for fitness and wellness and making a difference in the lives of others. I taught exercise classes while I was working as a reporter. I continued to write about fitness, and was fortunate to land job in corporate fitness. I worked with thousands of employees helping them to feel better about themselves and to improve the quality of their wellness. I enjoyed a 16 year career in the fitness industry teaching aerobics, training instructors, and customizing corporate fitness plans for employees. It was exhilarating to watch clients transform before my eyes and know that I was making a difference in their lives. Although I was passionate about my job, my feet got old before the rest of me and I was forced to leave the field. I met my husband, fell madly in love and had two kids. I enjoyed being a stay at home mother, but I needed an outlet for my creativity. I decided to run an ad in the newspaper for a home care professional. My proposed job duties would include cooking, errands, light gardening, etc. After running the ad for only one day, I received 20 phone calls! Four of those families became my first clients. Three months into my new ”entrepreneurial” job, a gardener was born. 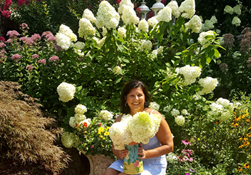 I was working as a home care professional on a spectacular four acre estate when the owner asked me to beautify her outdoor space. Since I had no experience with landscape gardening, I lived and breathed the classroom, devouring as much information on the subject as I could find. I was on a quest to find the most exquisite materials – plants, flowers, and other accessories – that would tell stories from place to place and space to space. I always say that my first experience in gardening was “priceless” because I truly had an unlimited budget. Together the client and I developed a plan that would transform her property into a personal oasis. 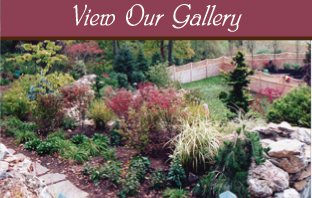 We purchased $100,000 in perennials and hundreds of ornamental shrubs and trees. The sky was the limit and my creativity soared. I found that I instinctively had a knack for blending colors, textures, shapes, and sizes to create a cohesive, inviting look. I paid special attention to how the property would grow and change over time. After all, this was a huge investment and I wanted to ensure it would be beautiful and easy to maintain for many years to come. For the next six and a half years, I was the personal gardener for the estate. A half acre had been cleared beyond the yard for a garden. 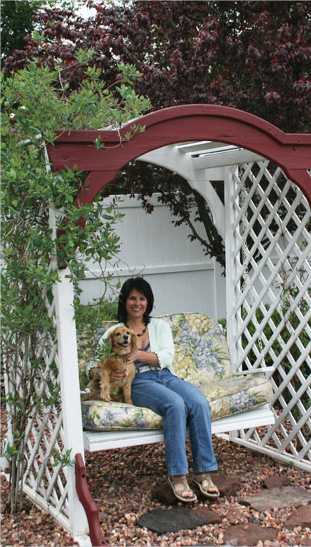 Working closely with landscapers, farmers, growers, nurseries, and retail garden stores, my vision came to life. I negotiated contracts, managed installations, and learned as much as I could from lawn technicians, arborists, excavators, and drainage experts. That first client referred me to several neighbors and I began embellishing properties in Tewksbury, New Vernon and Far Hills. One client nicknamed me “The Finishing Touch” because I added that “something extra” to a landscape to personalize it for the client. I will never forget the day I started working for a particular neighbor. The first thing I planted was a climbing yellow rose bush for the wrought iron arbor that marked the entrance to this new space. My client was touched and speechless. Little did I know that yellow roses were her father’s favorite flower. He had passed away recently and she felt like a little piece of him was with her now. That was a defining moment in my life. I could once again make a difference in someone’s life – not with fitness, but with plants. I knew this was my calling. I knew I wanted to start my own plantscaping business, but I was raising two children with unique needs. The timing wasn’t right. So, in September 2007 I enrolled in the Master Gardener Course with Rutgers NJAES RCE (New Jersey Agricultural Experiment Station Rutgers Cooperative Extension). After graduation I began the 125 hour internship required for certification. I volunteered at the Somerset County Help Line giving advice and guidance on a variety of garden related issues. I was involved in multiple community outreach projects and worked at Rutgers Snyder Research Farm in Pittstown, NJ. I also completed multiple courses at Rutgers to expand my repertoire. It was finally time to start my company; of course I had to call it “Final Touch Plantscaping”. In addition to running my business, I am also very active in the community. I work with the local Branchburg schools and several community groups to provide hands-on assistance and expertise. I believe that plants need people and people need plants. The healing effect of nature never ceases to amaze me. Currently, I am working on an initiative that will bring horticulture therapy to a diverse population in a clinical setting. I also provide extensive horticultural support and am writing a curriculum for a women’s halfway house in Whitehouse Station, NJ. Now that you know a little more about me, I invite you to learn about the services we offer and what makes us different from other general landscapers.